DCI.org's Christina Mavroudis-Dempsey interviews Phantom Regiment color guard member Stevenson Lumapas. Having the opportunity to play one of six male demon-like characters in Regiment's 2006 program "Faust," Lumapas discusses the role he plays in the production's story line and what it means to him to be part of a group of the first male Phantom Regiment color guard members in many years. 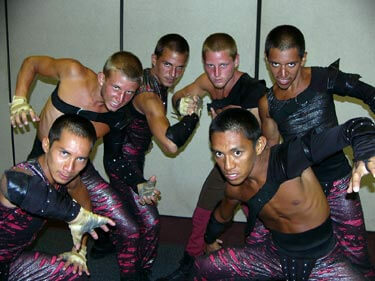 Male members of Phantom Regiment's color guard pose in character. This interview from July 22, followed Phantom Regiment's performance at the DCI Southwestern Championship in San Antonio, Texas. More interviews like this one are available exclusively to members of the DCI Season Pass.